The most effective cleaning products are often already in our kitchen cupboard. Read our quick tips for effective cleaning with simple products. To remove red wine stains use a white cloth and dab / blot as much of the surface liquid up as possible. When the cloth is no longer picking up stain marks and remains white, pour some cold water on the area and repeat the blotting until again there is no stain on the cloth. Prepare a baking soda paste – mix 3/1 parts of water to baking soda and apply to the area. Wait for this to dry and then hoover it off. 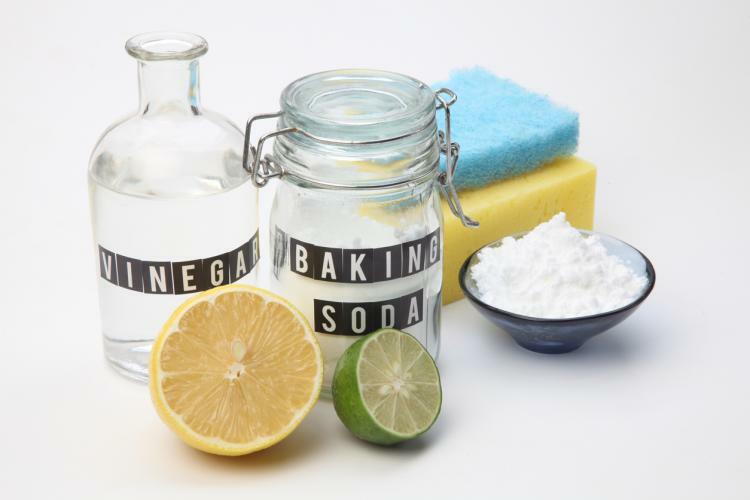 For an all-purpose cleanser, combine four tablespoons of baking soda with two pints of water and pour into a re-usable spray bottle, wipe with sponge to clean and bring a shine to all surfaces. Sprinkle baking soda into trainers or dog beds to refresh them, tip out or hoover up before use! Baking soda on a cloth will remove pen marks on walls as well. For blocked drains pour half a cup of baking soda down the plug hole, followed by half a cup of vinegar. Cover with a cloth to control excess froth and pour hot water down the drain after ten minutes.